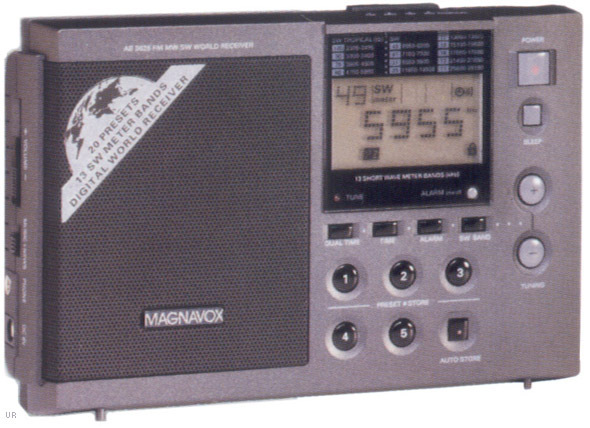 The Magnavox AE3625 is a portable receiver, covering AM, FM and 13 shortwave bands. The shortwave bands include: 11, 13, 16, 19, 21, 25, 31, 41, 49 meters plus four tropical bands: 60, 75, 90 and 120 meters. Frequency selection is via Up-Down buttons. There are also 15 available memory presets (5 AM, 5 FM and 5 SW). The dot-matrx LCD display has 1 kHz readout on shortwave. This radio has a built-in 12 hour clock with alarm (radio or beeper). There is an earphone jack. There is also a tone switch and Lock button. This receiver is powered from four AA cells (not supplied) or 6 VDC. 7.5 x 4.75 x 1.5 inches. Copyright 2006, Universal Radio, Inc.